Till the time we were together, I and my brother hardly had some cakes/muffins together… Of course, none of us were too crazy for any sort of sweets or even chocolates! Since he left India for further studies around 10+ years back, he has developed a sweet tooth :P And his little son too has joined his league, he doesn’t get to have much though! 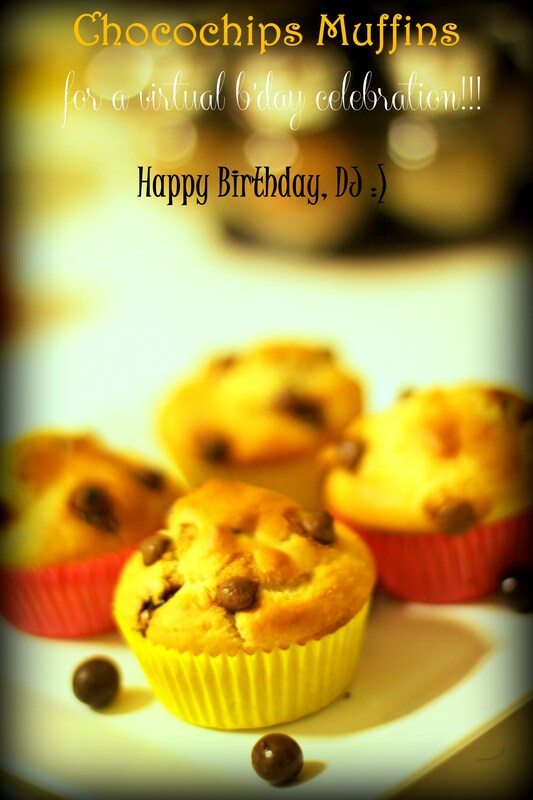 As I’m trying my best to get good hands on baking these days, I wish I could have sent him a few of these ‘Chocochips Muffins’ on his birthday!!! – Sift all the dry ingredients in a bowl. – Combine all liquid ingredients in another bowl and whisk them well. – Add liquid mixture to dry mixture and make a smooth batter with no lumps. – Mix chocolate chips into it and mix gently. – Line the muffin pan and bake it on 180 degrees for around 20-25 mins. – Cute looking muffins are ready to serve! Hi Dear first time saw your blog. You managed it well. Muffins looking tempting.